Measuring 35cm from the tips of her ears to the pads of her paws Fifi is a charmingly girlish white rabbit with a soft velour body and subtly – weighted torso. Dressed with delight in a pink floral gathered skirt & matching hand crocheted top. Wow, we are overwhelmed. We received our bed this morning and it is absolutely beautiful. Worth every penny. Can't wait for my daughter to get home from school! Thank you Little Lucy Willow. With a white, velour body and embroidered face, Poppy the Rabbit is sweet and soft from her fluffy tail to her patchwork ears. Poppy comes dressed ..
Phoebe comes dressed in a teal & cream striped dress with match hand-knitted sailors collar and is made from a lovely soft velour. 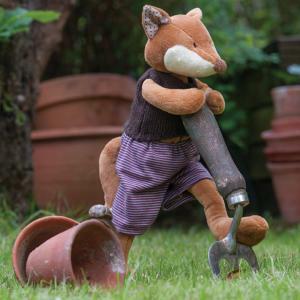 her nose is a contr..
Chester is the latest addition to our hugely popular 35cm character soft toys, he comes in a beautiful brown two tone soft velour, has a long bushy ta.. This high quality 100% organic cotton dotty pink duvet set would be a wonderful addition to your child's bedroom. This duvet set is not only pretty wi..
Sophie the ballerina is wearing her best dancing skirt and soft voile petticoat – with a matching cardigan and soft velour slippers she is ready for h..
We are very proud to introduce our brand new pull along soft toy Cat called Cleo! Cleo is a delightful black and white cat with four small white socks..